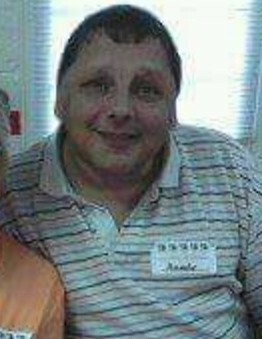 Randall “Randy” Jacobs, age 54 of Laurinburg passed away Wednesday, October 17, 2018. Randall, son of Eulah May Jacobs Powers and the late James Powers was born November l5, 1963 in Scotland County. He loved being out of doors swinging in his swing, playing drums and his guitar. He had a passion for animals and enjoyed caring for all types. He liked drawing, coloring and making crafts. Randy enjoyed attending Fletcher Chapel Wesleyan Church and the R.H.A. where he made many friends. He was also a favorite fan of the Miami Dolphins and NASCAR Racing. Although his life had many challenges, Randy will forever be loved and remembered as a devoted son, brother, uncle and a friend to many. He leaves behind his mother, Eulah May Jacobs Powers and sister, Holly “Sister” Powers of Laurinburg; niece, Brittney “Little Brit” Tryon (Robbie); nephew, Richlan “Duder” Powers all of McColl, SC; great nieces, Breanna “Little Bre” Tryon and Hannah Tryon; special aunt and uncle, James and Mary Ross and his many cousins. Funeral services will be at 3:00 Friday, October 19, 2018 at Richard Boles Funeral Service Chapel officiated by Rev. Andy Stewart. Burial will follow in Pinecrest Cemetery. The family will receive friends prior to the service on Friday from 2:00 until 3:00 p.m. at the funeral home. The family requests for memorial donations to be given to Fletcher Chapel Wesleyan Church.